This weekend was a somewhat rocky one in project-dom. I attribute the trouble to my setting out to complete things. Why else would not one but two projects–in as many days–conspire against me? First there was a recycled t-shirt project that I’ve been working on, literally, for months. It began as a little seam-sewing exercise and almost immediately transformed into a battle of wills between the sewing machine and me. The thread got stuck. I unstuck it and rethreaded the needle. The feeder ate the fabric. I tugged that out. The thread contrived to jam itself under the bobbin housing. I pulled everything out and started over. And then the machine began to work a stretch stitch. Spontaneously. I don’t know how it did that–I didn’t even know this machine had a stretch stitch on it–but I couldn’t get it to stop. End t-shirt project. Moving on, I thought I could make progress on some spinning. 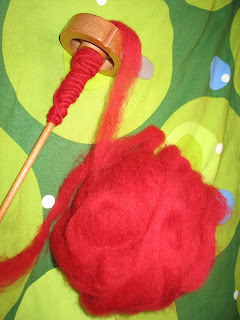 This post on Brooklyntweed’s blog had inspired me to give spinning another try. I had some red wool fiber from a Christmas felting project (note the unusual hue of red) in my stash, and so I started drafting. That was the easy part. Spinning was something akin to pulling teeth. The yarn came out thicker than I’ve ever been able to spin, which is something, but it was completely unbalanced and flagrantly thick and thin. I’m sure there are myriad things that I did wrong, but I would like to note that the fiber was very low-grade fiber. The project I had the most success with was the one I didn’t actually start. 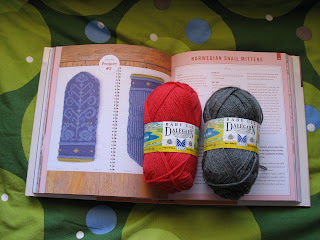 I received Clara Parkes’ Book of Yarn for my birthday, and decided that snail mittens in gray and red (with black accents) were a must, particularly because it won’t be cold enough to wear them for another 6 months at least, giving me plenty of time to circumnavigate the impediments that seem to be inherent in all my recent projects.